Cannabis Now breaks down the best of marijuana in 2017, from the best edible to the best sauce and more. After 2017 came to a close, 2018 started with a bang with California opening up for adult-use sales. But before we move forward full-heartedly into another year, it’s always productive to look back upon the excellence we experienced this last trip around the sun. For example, 2017 brought us to new heights of terp sauce, delivered a purple cult-classic strain, introduced Nevada to the adult use recreational marketplace and, of course, ended with the best event of the year: The Emerald Cup. Here are Cannabis Now’s top picks for the best the marijuana industry had to offer in 2017. We’ve followed 3rd Gen Family’s efforts this year since we first got to sit down with them and chat about Rozé at Chalice in July. At the time, Rozé was being regarded as one of the hypest of the next generation of Zkittlez cuts. Now, following a second place Emerald Cup finish and the accompanying Breeder’s Cup, the rest of the world has found out about Rozé’s glory. This year’s batch of Moonshine Melts and sauces, which took home plenty of awards in their own right, reaffirm this pick, since they were obviously made with something special. Honorable Mentions: Alien Labs, The Jungle Boys, C.R.A.F.T., IC Collective, Eden Farms, Greenshock Farms, Jigga, Str8organics, Soul Evolution Enterprise, Rare Dankness, Nameless Genetics, Zkittlez, Tahoe Wellness Collective, Foxworthy Farms and Mr. Sherbinski. Everybody is in love with the newest — and first purple — cult classic we’ve had in awhile. As folks searched out gassy OGs and the best fake Cookies they could find over the past few years, great purple definitely fell off a bit. Some claimed purple cannabis, generally with a decent serving of the terpene myrcene and its heavy body highs, would not pass testing. If you were one of those folks, Purple Punch has proved you wrong. Supernova Gardens hit it out of the ballpark with this one and new variations from master breeders like The Village have us excited to see what 2018 has in store! Honorable mentions: Tropical Sleigh Ride, Rozé, Starkiller OG, Watermelon, Sour Banana Sherbet and Gas Leak. 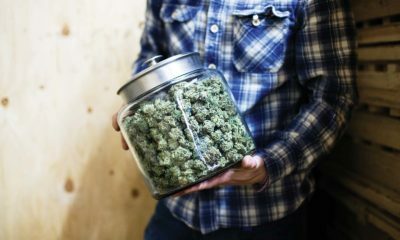 When Nevada opened its doors to adult use cannabis sales on July 1, the state immediately jumped onto the radar as one of the country’s new hubs of legal cannabis. According to Forbes, the state sold nearly $40 million dollars-worth of pot in October and, since rec sales began, the state has collected nearly $20 million dollars in tax revenue. Most importantly to some, America’s playground of Las Vegas is providing all those tourists with a glimpse of what a responsible adult use cannabis market looks like. Sauce was king in 2017. With the simplified production process, the excellence of a particular sauce comes down to time and quality of the material. Nobody hit the nail on the head for us this year quite like Royal Key Organics. They essentially released 19 limited batches, each special in their own right. When dealing with companies that that hunt down the perfect plants to process and then grow them in-house, it’s pretty easy to see just how much love went into the product by the time it gets to the jar. Om Edibles capped off their 2017 by receiving the first production permit in California from the City of Berkeley. Now, many years after Om’s cacao spread first made waves, the edibles line continues to spread in fantastic directions, including the introduction of a sweet bath bomb (not to be eaten). Om Edibles’ founder Maya also gave a speech at the Emerald Cup after winning the CBD edible category with their freeze dried organic mangos that was one of the most memorable of the whole event, as it featured a longtime advocate preparing for the brave new world of cannabis. We’ve seen a lot of athletes attempt to enter the cannabis game with varying results. While some of those names may have had wondering “who?,” this is simply not the case with Jack Ham. NFL Films ranked Jack Ham as the 60th greatest player of all time on a list that favored offensive players (Ham was a defensive outside lineman) and he is a member of the NFL Hall of Fame, with eight appearances in the Pro Bowl. Also, Ham is currently only 10 pounds short of his playing weight despite the fact that he’s nearly 70 years old, so he’s first pick for Cannabis Now’s Flag Football team. Over the past couple years, all the random producers that bought extraction hardware at businesses conferences and are scared of volatile gases diluted the market a pinch, but we need only look to the winner of this year’s Secret Cup to see the craft is still in its finest form. We don’t have to make solventless great again, we just have to look beyond the mediocre solventless flooding the market so that examples like this one can shine through the noise for first-time dabbers. Like the Team Japan show in Vancouver in 2016, this year’s All Japan Show in Denver gets the nod for our favorite glass of the year. The collab between Banjo and the Team Japan Original members is the stuff of legend with over 200 man hours put into it. The rest of the show featured a ton of great artists and, our favorites: Slop Cups! Stamped aluminum and cheap grinders from industrial centers north of Hong Kong have become the norm, so we very much appreciate the craftsmanship of the Phoenician. As opposed to just stamping out the holes, the Phoenician has the gaps machined out. This allows for a much better quality of ground cannabis, especially when you’re about to roll it. Instead of getting a dust, you get a salad! It’s fantastic. Allen and King have helped lead the community rebuilding effort following the devastating fires that swept through Northern California. King organized volunteers and donations while the fire was still roaring via The Soil King Garden Center just north of Santa Rosa, while Allen has spent the months since raising hundreds of thousands of dollars to support impacted farmers. The outdoor organic pot world championship outdid itself this year with a little help from Mother Nature. With the best weather the event has seen in years, attendees poured into the Sonoma County Fairgrounds to enjoy some of the world’s best pot. They were not disappointed, as this year’s crop was on par with the weather for sure. Don’t just smoke it, get the hoodie. The Cookies brand has evolved at a whirlwind pace and can very reasonably be called the official clothing brand of heads in the San Francisco Bay Area’s urban centers of Oakland, San Jose and San Francisco. We generally love the line, whether it be a nice bud shot on a T-shirt or an embossed letterman jacket. Also, the quality is up to the standard of the family name. In an America fearing collaboration between our executive branch and our old Cold-War foes, the new Russian Cream flavor from Backwoods was everything we were hoping for to start rebuilding our relationship with Moscow. Some of the strains we felt stood out the most when spun up in a Russian Cream include Purple Punch, Strawberry Banana and Trainwreck. TELL US, what are we missing on this list? What were your favorites of 2017?